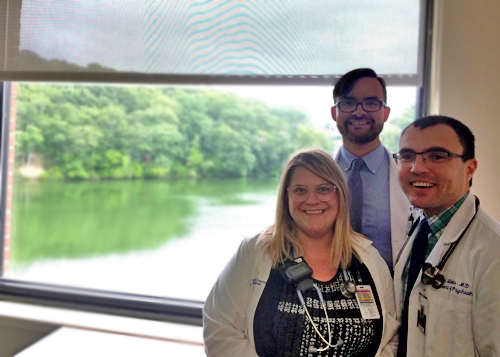 Jessica Dodge, Austin Greenhaw, and Radu Iliescu on their Internal Medicine Rotation. The PGYI program is designed to provide residents with the medical experiences and skills that are most relevant to psychiatric practice. Residents will spend four months on the medical services at Mount Auburn Hospital. a Harvard Medical School teaching hospital in Cambridge, MA. PGY1 residents also rotate for one month on the Neurology Consultation Service at Beth Israel Deaconess Medical Center. Residents spend one month on a rotation in substance abuse at the Veterans Administration (VA) Hospitals in Brockton and Jamiaca Plain, providing individual and group treatments for patients with substance use disorder in the inpatient and residential settings. Residents spend three months rotating at Beth Israel Deaconess Medical Center where they learn about the assessment, diagnosis, and treatment of acutely ill psychiatric patients. One-and-a-half months are spent alternating between the Emergency Psychiatric Service and Night Float call on the Deaconess 4 Inpatient Psychiatry Service.